Gold Coast, Queensland , The Spit, Main Beach, Surfers Paradise, Broadbeach, Mermaid Beach,, Nobby Beach, Miami, Burleigh Beach, Burleigh Heads, Tallebudgera Beach,, Palm Beach, Currumbin Beach, Tugun, Bilinga, Kirra, Coolangatta,, Greenmount, Rainbow Bay, Snapper Rocks and Froggies Beach. The Gold Coast is a city in the Australian state of Queensland. It is the second most populous city in the state and the sixth most populous city in the country. It is also the most populous non-capital city in the country. The Gold Coast is known as a major tourist destination with its sunny subtropical climate, surfing beaches, canal and waterway systems, its high-rise dominated skyline, nightlife and rainforest hinterland. Gold Coast City is situated in the southeast corner of Queensland, to the south of Brisbane, the state capital. It is separated from Logan City, a suburban area of Brisbane by the Albert River. There the Gold Coast City stretches from Yatala and Russell Island to the border with New South Wales approximately 56 km (35 miles) south, and extends west to the foothills of the Great Dividing Range in World Heritage listed Lamington National Park. The city consists of 57 kilometres (35 miles) of coastline with some of the most popular surf breaks in Australia and the world including, South Stradbroke Island, The Spit, Main Beach, Surfers Paradise, Broadbeach, Mermaid Beach, Nobby Beach, Miami, Burleigh Beach, Burleigh Heads, Tallebudgera Beach, Palm Beach, Currumbin Beach, Tugun, Bilinga, Kirra, Coolangatta, Greenmount, Rainbow Bay, Snapper Rocks and Froggies Beach. Duranbah beach is one of the world's best known surfing beaches and is often thought of as being part of Gold Coast City, but is actually just across the New South Wales state border in Tweed Shire. The official name for the beach is Flagstaff Beach. Duranbah is a small town located about 12 kilometres (7 miles) southwest of the beach, but the name Duranbah Beach has become its accepted (if not official) identity. Surfers Paradise is a suburb on the Gold Coast in Queensland, Australia. Colloquially known as 'Surfers', the suburb has many high-rise apartment buildings and a wide surf beach. The feature of the central business district is Cavill Mall, which runs through the shopping precinct. Cavill Avenue, named after Jim Cavill, an early hotel owner, is one of the busiest shopping strips in Queensland, and the centre of activity for night life. It's the best known feature of the Gold Coast's skyline. Burleigh and Coolangatta also have skyscrapers, though shorter and fewer. 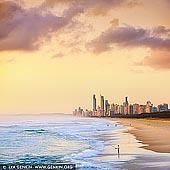 Surfers Paradise is the jewel of Queensland's Gold Coast and one of the most popular holiday destinations in Australia. Surfers Paradise is where you'll find the perfect fusion of city and beach lifestyles set amidst a spectacular skyline and brilliant stretch of coast. Once you arrive, you'll soon feel that you've literally arrived in paradise. Q1 (meaning Queensland Number One) is a supertall skyscraper located in Surfers Paradise, on the Gold Coast. It is the world's tallest residential tower, the tallest building in Australia and the second tallest in the Southern Hemisphere, behind Auckland's Sky Tower. The Q1 building has QDeck, the observation deck at levels 77 and 78 is Australia's only beachside observation deck, and has room enough for 400 people. It towers 230 metres above the Surfers Paradise beach, giving viewers a 360 degree view of Brisbane to the North, The Gold Coast Hinterland to the west, Byron Bay to the South and the Pacific Ocean to the east.